Almost all of the Donegal Relief Fund Immigrants to Australia passed this way. 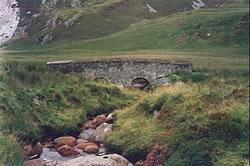 People leaving the west side of Muckish Mountain and heading for the port at Derry needed to pass this way, so thousands on their way to Australia and America would have walked over this bridge, and many of those left behind on one occasion were themselves farewelled at the same place a year or two later. The name has come down through oral Irish folklore and in the local Falcarragh area it is known as "The Crying Bridge"; in Irish = Droichead Chaointe (Chaon = to cry) or Droichead na ndeor (na ndeor = tears). "The Bridge of Sorrows", is a more recent but acceptable translation for the bridge. Literal translations from Irish into English can frequently incur such distortions so you can imagine the difficulties experienced by the Ordnance Surveyors in the 1830s. It's hard to beat a bit of confusion!